Grilled Haloumi Salad with some crunch! This is & SUPER TASTY SALAD where you can put anything in that you like! 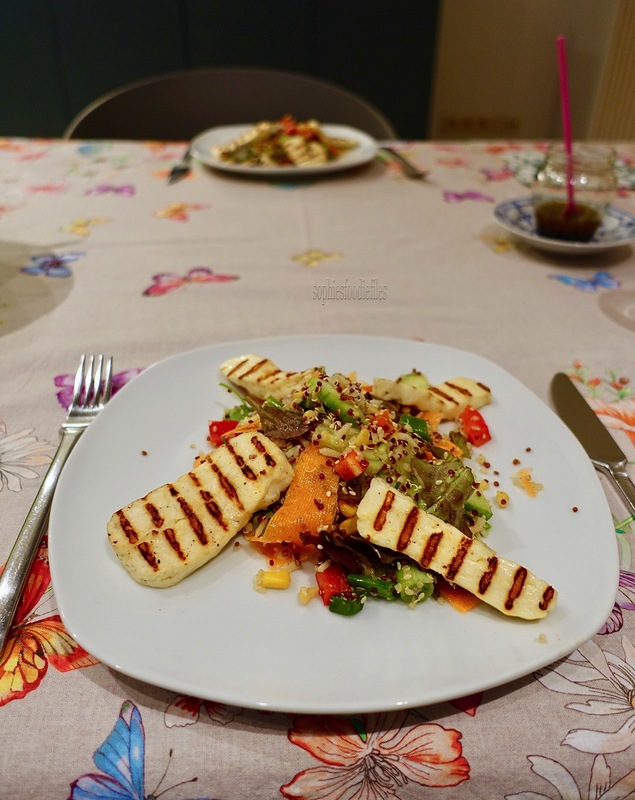 I used a combo of 3 sorts of quinoa & raw &cooked veggies & grilled haloumi salad. Perfectly topped with a simple home-made balsamic vinegar dressing! It is THAT SIMPLE! Let’s make it now! cold cooked quinoa for 3 persons: I used a combo of white, red & black quinoa that I cooked in some hot vegetarian stock & drained well, put into the cold fridge. Take your cold cooked quinoa out of the fridge & add all other veggies to it except the salad leaves! Mix well & season a bit with black pepper & some sea salt. Place back into the fridge for at least 1 hour. Heat grill pan up on high heat. side. Take chopping board & place all strips of haloumi on it. Brush one side with that lovely olive oil & wait until grill pan is extremely hot. When hot, place your oiled haloumi strips onto the hot griddles of the pan & grill for at least a few minutes each. Place them the way that you will have horizontal stripes on your cheese. That looks so pretty! Brush the upside with olive oil. Grill them for 1-2 minutes more. Turn, heat off. At the same time, make the simple quick dressing. Take a fitted jam pot & add all ingredients. screw lid on & shake jam pot up & down a few times to let the ingredients mingle. Taste. It must taste lovely! Plate up. Place mix of salad leaves all over each plate. Place 2 spoonfuls for more of your quinoa-veggies mix on top of the salad leaves & arrange 4 haloumi slices per plate. Now, just before serving, drizzle a few teaspoons of the dressing all over your quinoa salad but not over your haloumi, please! Enjoy, with loved one’s & a nice glass of chilled grenache rosé! ♥ Stay Tuned & subscribe by email! Join 2,000 email subscribers now!!! It is free!!!! Click the link here below to subscribe!!! Previous Post Sourdough Rye Bread! A thing of beauty! Next Post Latest harvests from our garden with yummy recipes! Easy and very tasty! Love the beautiful grill marks on the haloumi.